The two day introduction to green woodworking course with a couple of returners. 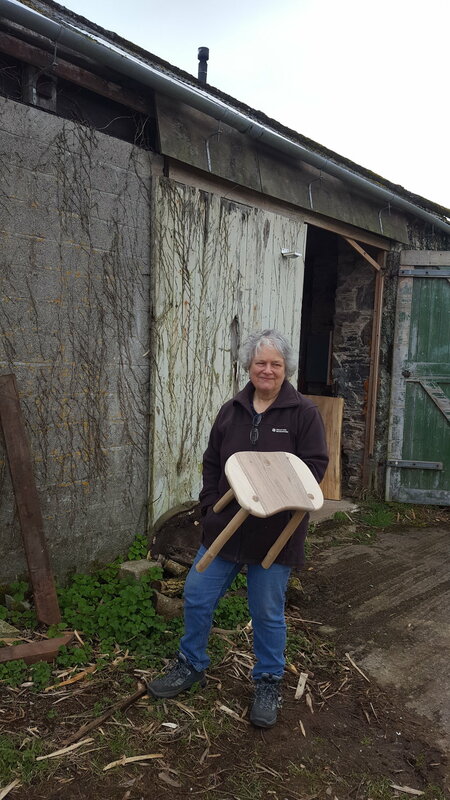 The Introduction to Green Wood Furniture course has now been taken by hundreds of people, all of whom have taken home a brand new, utterly unique piece of furniture. These pieces will hopefully, ultimately become family heirlooms. Perhaps they will be handed down from generation to generation. All the basics of green woodworking are covered in this course. Starting with a freshly felled log of ash, sweet chestnut or some other local hardwood. Pieces are split and shaved. A rough sawn plank is cut shaped, refined and travished, and then on day two the whole lot is brought together using through-wedged mortice and tenon joints in the final piece. Final pieces and happy faces! There is a profound sense of satisfaction at taking such basic raw materials and turning them into treasured pieces of furniture.